In the State of Rajasthan, India there are any places to visit. Jaipur is one of them. 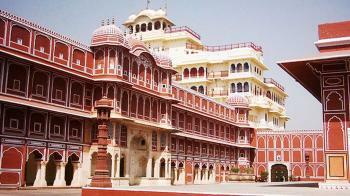 Jaipur is the largest and Capital City of Rajasthan. Hindi, English, Brajbhasha languages are used in this place. Jaipur is famous for Forts, Palaces and Monuments. Ridhi Sidhi Pol is famous place in Jaipur. This place is popular for History Buffs, Experience Seekers and Fun Lovers. Visitors can spend 1 hour easily in this place. Ridhi Sidhi Pol is located near the heart of the city. There are many attrations near this place. Ridhi Sidhi Pol is an important doorway in the magnificent City Palace of Jaipur. Ridhi Sidhi Pol bears both Rajput as well as Mughal architectural elements. Ridhi Sidhi Pol has four small doorways. These four doorways representing the four seasons. Peacock Gate representing autumn and dedicated Lord Vishnu, Lotus Gate representing summer and dedicated to Lord Shiva-Parvati, Green Gate representing spring and dedicated to Lord Ganesha and Rose Gate representing winter season and dedicated to Goddess Devi. It has been named after the main idol Lord Ganesha and his consorts, Ridhi and Sidhi. The timing of the Jantar Mantar is from 9:00 AM to 4:30 PM in all days of week. The best time to visit in Jaipur is in winters from October to March. In Summer : The temperature in summer is 25 degree Celsius to 45 degree Celsius. In Winter : The temperature in winter is 5 degree Celsius to 22 degree Celsius. By Air : Sanganer airport is the nearest airport. The distance of this airport is 10 km from Ridhi Sidhi Pol. By Rail : Jaipur Railway Junction is the nearest railway station. By Road : Ridhi Sidhi Pol is well-connected to all major cities.